Whether you’re making a turkey for Thanksgiving or just any day of the week, this recipe is worth the preparation and work. I have friends that usually make a ham for Thanksgiving because they’ve never had a turkey worth repeating every year, until they had Thanksgiving at our house last year. Now they can’t wait to have it again and I can’t wait to get started on it. I adapted this instruction from my mom’s recipe at www.offthegardenpath.com. I informed her that hers was difficult to follow and every time I turned around there was a new ingredient I needed and hadn’t bought because it wasn’t listed at the top where I had gotten my shopping list from. This version here lists everything at the top that you need as well as adapts the recipe for a Large Grill Dome. This is a complex recipe that requires days of preparation but don’t worry, there’s plenty of down time in between and the outcome is….so worth it! If you have any questions, please feel free to comment with your e-mail and/or question and I’ll get back to you as soon as possible. 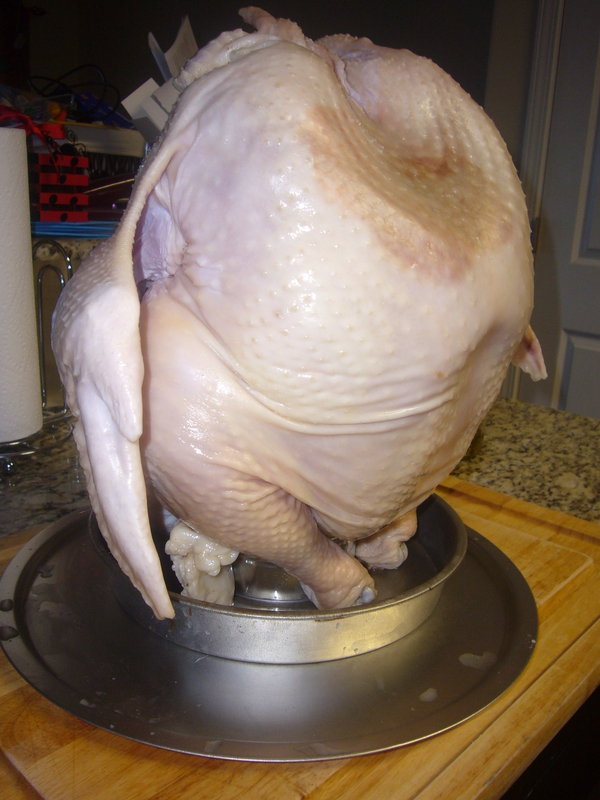 -Prepare/disinfect bucket to hold turkey. -Thaw turkey well before the day you brine it (Wednesday AM) which is 24 hours before the day you grill it (Thursday AM)(about 3 days in the refrigerator). She’s going to be brining in the refrigerator for a whole day; so make some room in there for it. 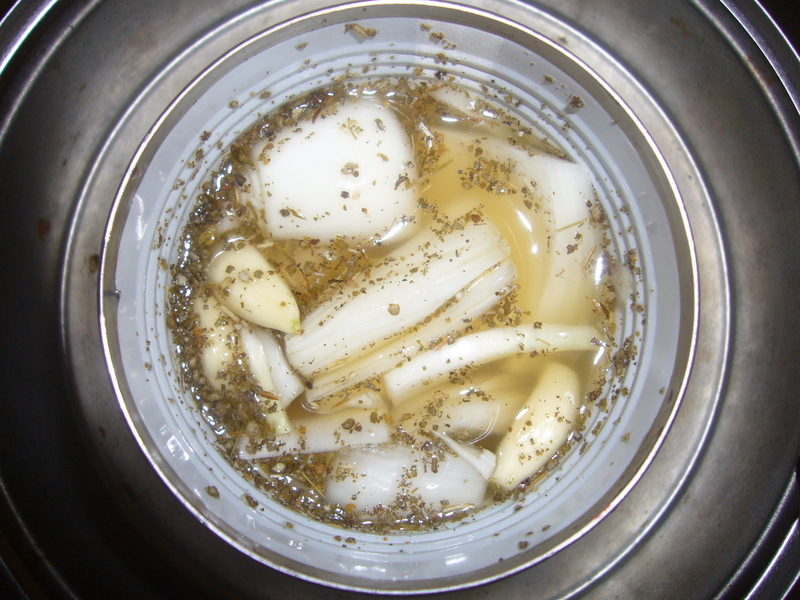 -Mix the brine ingredients in a large pan, stir thoroughly and bring to a boil. -Cook for 10 minutes, or until the vegetables are tender. -Remove any and all packaging from turkey and rinse the turkey inside and out. -Place turkey inside the plastic container, strain the brine and pour the broth over the turkey. It should cover the turkey completely. Add more water if it doesn’t. Leave in the fridge for 24-36 hours. You will be using the indirect heat grilling method. -Remove top grid and place aside. -Place coal baskets on each side of grill away, on the lower grid and away from the handles. – Fill the coal baskets with 3 lg. pieces of crumpled black and white newspaper. -Place about 25 briquettes on top of newspaper in each basket. (You can use a fluid starter if you like; just be careful and follow directions.) It’s good to have heat proof oven mitts or fire gloves on hand and a water bottle sprayer just in case. -Adjust your air vents accordingly. *Because the Weber has an adjustable vent control; check beforehand and mark the half-way opening setting and the fully opened setting. Use the fully opened setting when you first light the fire and start grilling. Close it down to halfway about a half an hour into grilling once you have a good fire going. 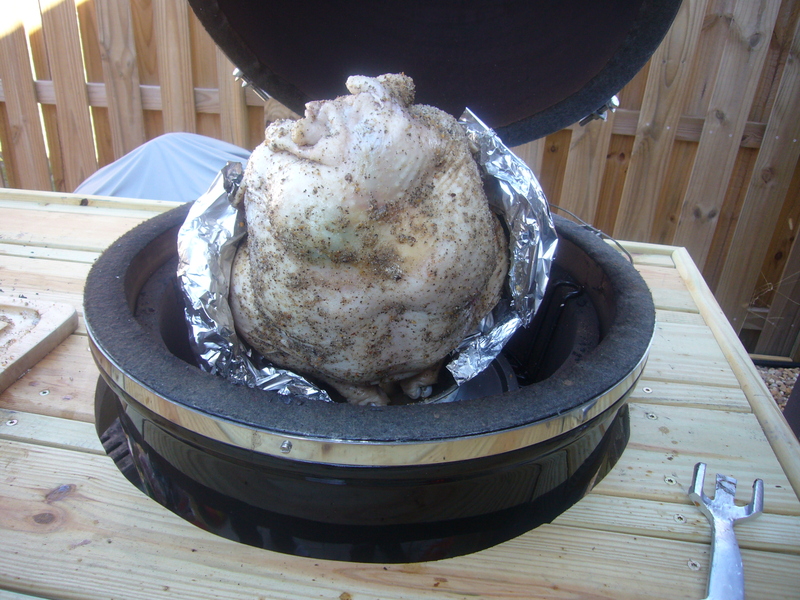 -(GD) Heat the smoker up to 275 °F, adjust air vents as needed. My husband is known as Uncle Gadget so he has all sorts of thingamajiggers on his smoker to control the temperature. 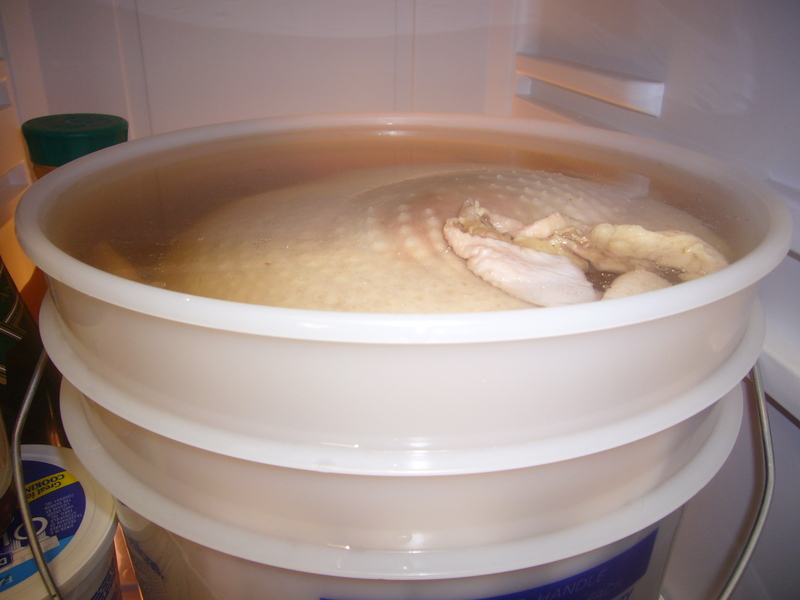 -Rinse the turkey after 24-36 hours of brining, in cold water. -In the 20 oz. 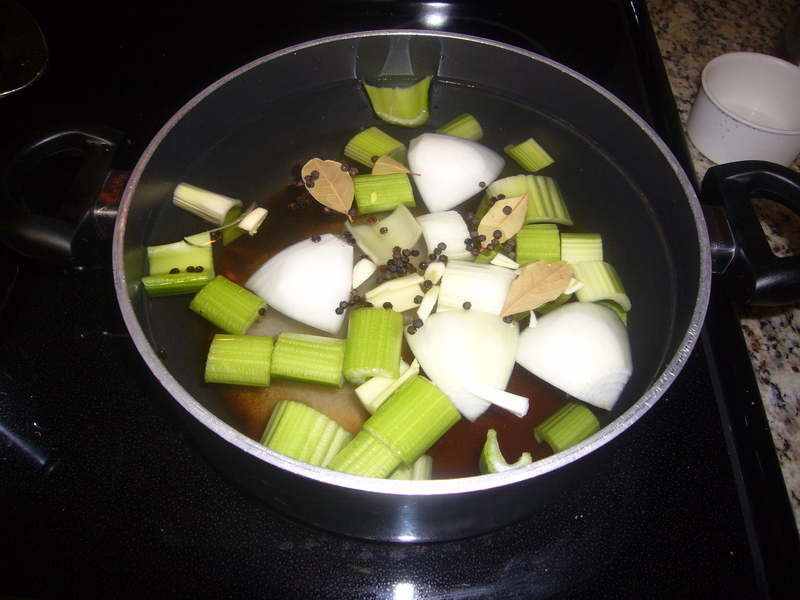 can (or Throne), add your “stuffing” ingredients: chicken broth, beer, dried sage leaves, bay leaf, onion, garlic cloves. Picture 4: ready to shove this up the turkey’s tookus? -Put the filled can in the drip pan (a sturdy, old metal cake pan will do. Make sure it has some depth to hold the juices). 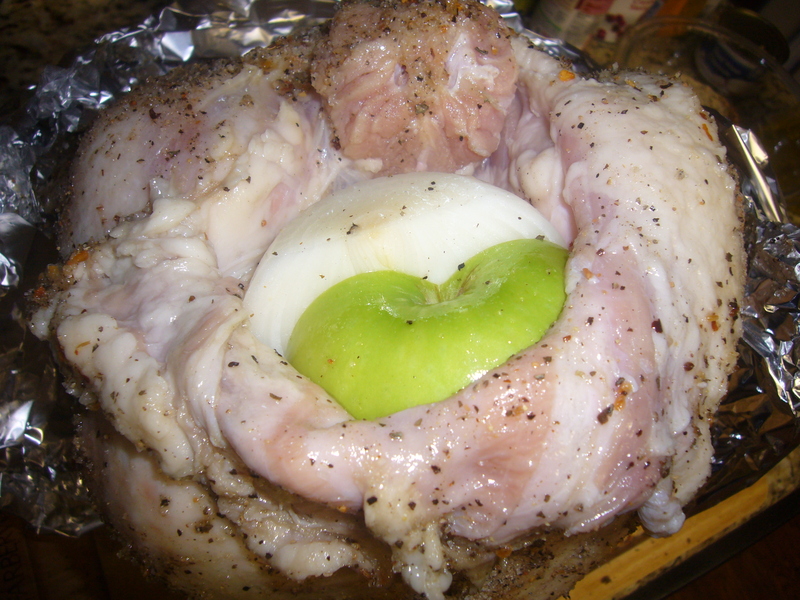 -Place the bird on the can through the area you would normally stuff with dressing. –The legs should be facing downward so the bird looks like he’s dancing. Picture 5: Everybody was Kung Fu fighting. -Rub the bird all over with olive oil. 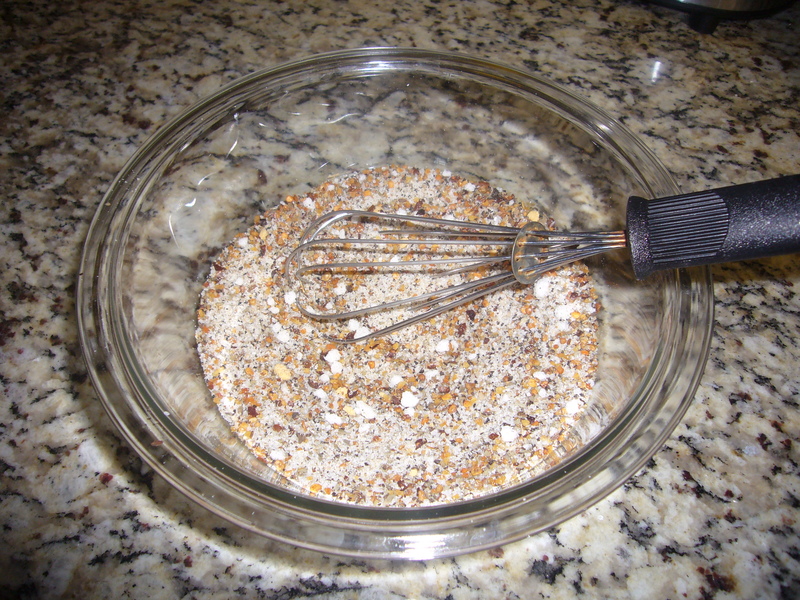 -Combine rub ingredients in a bowl. 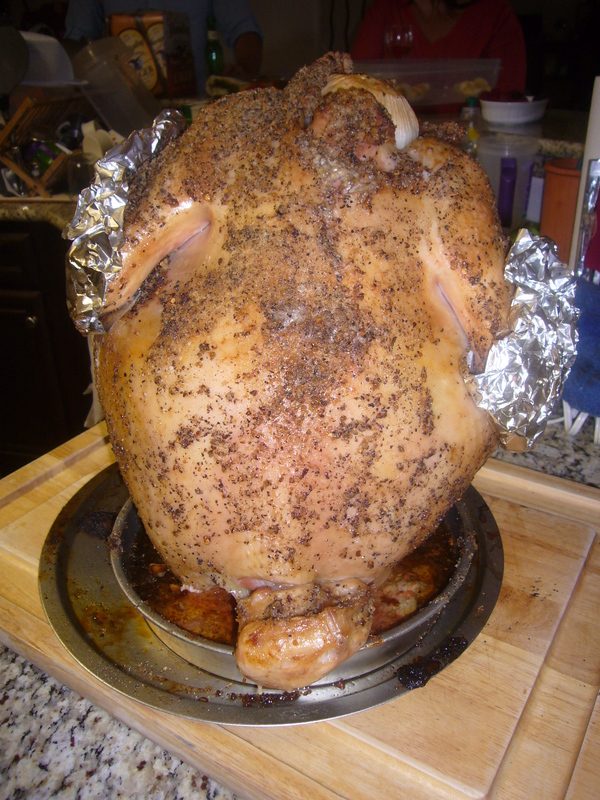 -Rub the dry rub all over the bird; being careful not to spill the contents of the can. -Cover the drumsticks with heavy duty foil to prevent over-cooking. -Place them inside the top of the bird to hold the steam and flavors in. Picture 8: This keeps the inside moist and full of flavor from the can. What a lucky turkey! -Place the bird and can with the drip pan on the bottom grid between the two coal baskets. (GD) on a pizza tin pan (see picture 5) then in the center of the smoker to give sturdiness and even heating in the smoker. She’s ready to smoke! mmmmmm, I can almost taste the Thanksgiving turkey now! – Adjust your vents for full opening for the first 1/2 to 1 hour; then close to 1/2 way. – Replace the grill cover and open the vents completely throughout the cooking process. -The inner temperature of the bird, when finished, should be about 160°F. It will continue to cook to proper temperature while ‘resting’. You can check the temperature after an hour and a half by place a good thermometer in the turkey just above the drumstick. It should read 160°F. 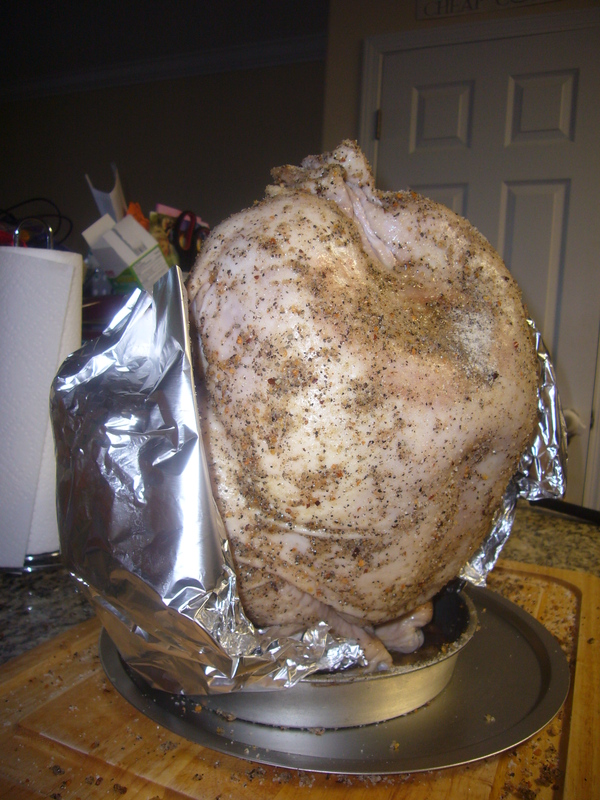 -Carefully remove the drip pan, can, and turkey together. You will probably need more than two protected hands to do this. 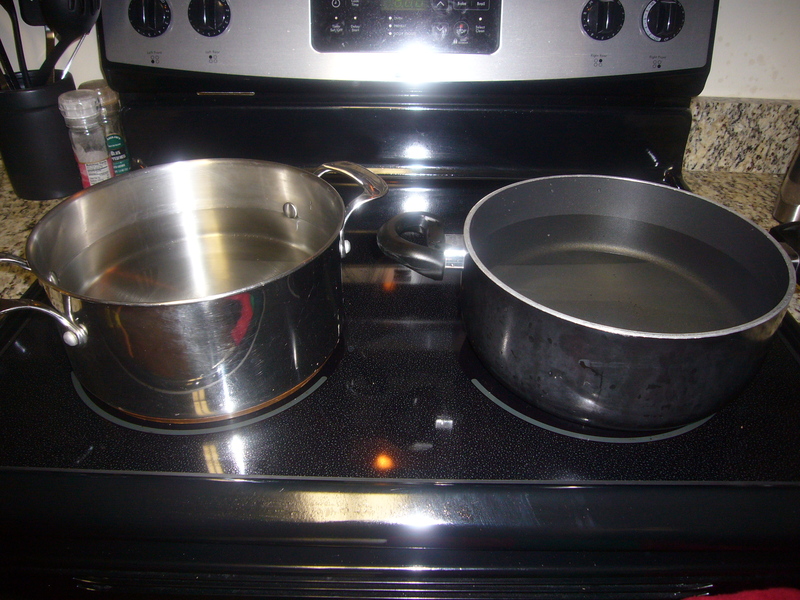 -Remove the can without spilling the contents and place the turkey in a 9×13 pan or dish. The turkey will sit in the juices while ‘resting’. The longer it sits, the better it will taste. Set your timer for an hour to ‘replenish the briquets’. You want to maintain an even temperature, so don’t keep peeking at the bird to see if it’s done. Optimum temp at 275°F. For the 14 lb. turkey, it took only 2 hours or less to cook thoroughly. A 20 lb turkey takes about 3 1/2 hours. The meat will be pinkish looking due to the ‘smoking’. Take the juices from the turkey and strain them into a pan, add 1-2 bouillons and bring to a boil. Slowly whisk in the corn starch mixture to thicken up the gravy. Do not feel you need to use it all, just enough to reach your desired consistency. Continue to boil for 10 minutes whisking frequently.